Leave your leaves and let those sticks, well, stick around! Preparing our yards for the fall and winter usually means cutting back plants, raking leaves, and generally tidying up. While aesthetically pleasing for us, in doing this we often remove the shelter and food sources for overwintering critters. Insects, salamanders, and small mammals depend on the yearly leaf fall to survive through the winter – using fallen leaves as a winter food source, a place to lay eggs, or protection from the elements during hibernation. Consider leaving or re-purposing the leaves and plant matter in your yard to create haven for native insects and animals. Fear not – leaving leaves in your yard does not need to be as messy as it sounds! If you cannot allow leaves to stay where they fall, choose a corner of your yard that you can pile up your leaves. The leaf pile can be free standing, or you may choose to contain them with chicken wire or a cardboard box. Extra leaves can be placed around the base of ornamental shrubs, trees, or anywhere you might already have mulch. It is important not to grind or chop your leaves when collecting them to avoid harming any eggs or insects that already call the leaves home. 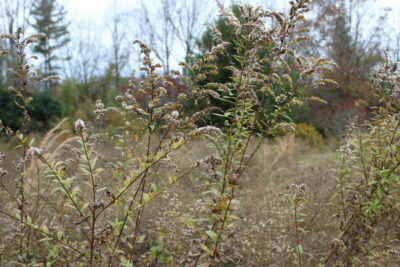 Once piled, the leaves will decompose through the winter and can be a (free!) replacement for mulch or soil additives in the spring. Hollow stems and shrubs are excellent overwintering habitat for solitary bees and other garden pollinators! 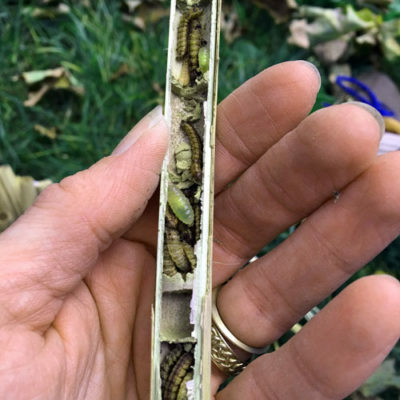 Leave stems standing through winter and cut them in late spring, giving insects time to emerge when the weather warms up. If trimming your plants is necessary, save the trimmings and allow them to decompose with raked leaves for use in the spring. Collect fallen twigs and branches to use as erosion control in your yard. Place them perpendicular to a sloping area to support the soil and encourage new growth. 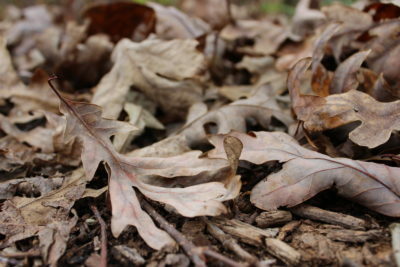 Not everyone can leave leaves, sticks, and dead or dormant plants in their yard – and that’s okay! Create a space in your yard that is appropriate for your neighborhood and lifestyle. Even a small, backyard plot to support native habitats makes a difference.